At the start of the month I gave you my top tips on buying gifts for the little kids, big kids and teenagers. These next two posts will give you plenty of ideas for the grown ups in your life. Some people may see a watch as an unnecessary item nowadays, after all owning a mobile phone means you will always have something on you that can tell the time, right? Well not necessarily! For starters phones run out of batteries, a lot, there are also plenty of occasions and places where you can’t use a mobile phone at all. A wood watch from Jord takes owning a watch to a whole other level, they are highly decorative and even though they are chunky they are very light. This Delmar in dark sandalwood & blue cobalt is a very stylish watch that any man would love to find under the Christmas tree. Compatible with most smart phones up to 5.7″, these goggles immerse you fully into the world of virtual reality. You can watch 3D movies and also take advantage of many of the interactive virtual reality apps and games that you can download. To get the full experience plug in a set of headphones to be completely immersed in the virtual reality experience. Haynes manuals have come a long way since they were first published back in the 60’s. This zombie survival manual is full of diagrams, step by step instructions and techniques for everything you will need to know from preparing your home, zombiology and moving safely around a zombie invested area. This manual is a must for any walking dead or zombie fan or anyone who believes that a zombie apocalypse is just around the corner! Every man needs a good wallet and this smart one from the designer Jasper Conran is bound to be gratefully received on Christmas Morning. It is fashionable yet functional with plenty of space for cards and also features a coin pocket and a fold out ID wondow. A puzzle is always on my list for a small stocking filler type gift. Lee loves Rubik’s cubes and sudoku so this Sudokube brings the two together nicely, making one very addictive challenge that will bring hours of fun. I’m pretty sure everyone else in the house will be trying to have a turn too. Christmas is a time when most people get a few days off work and get to sit back and relax for a few days. This thoughtful hamper contains everything a man will need to chill out of an evening from beers to savoury snacks, cheese and sweets. Hopefully he will even let you share! 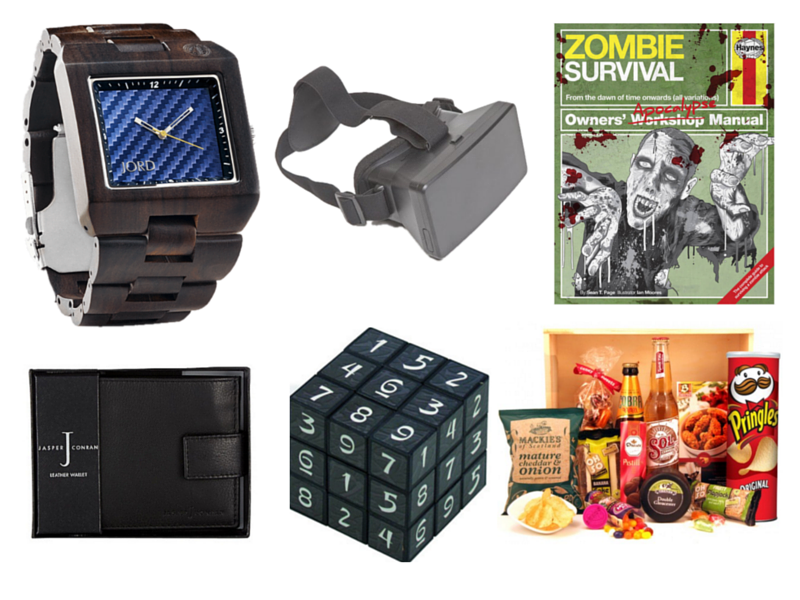 So there you have it six fantastic gifts for men that I have found online. Come back tomorrow for a selection of gifts any woman would love! The third of my Christmas gift guides is for the older children your family. This age can be difficult to buy for, especially if you are trying to find something that isn’t merchandise for the latest big film or video game release. But there are plenty of great products out there that will keep any older child occupied for hours. For more inspiration please check out my gift guides for teenagers and younger children. If your anything like me, you will worry about where your child is whenever they leave your house. LV is of the age now where he disappears off on his bike or scooter and often looses track of time and rarely has his phone on him. The Moochies watch solves this problem bynot only being a phone, your child can phone two preset numbers and can be contacted by ten. But it also has a gps tracker so as a parent you can see exactly where they are and even get contacted if they go outside of the predetermined ‘safe zone’. There are four designs so there is something that will suit every one. Construction kits are always high on the list when I’m looking for Christmas presents. This impressive looking car needs to be put together before adding a few drops of salt water to get the wheels turning. This is a simple and fun way to encourage engineering skills and also teach children about clean, alternative energy. I wish I had found this kit before Santa had finished buying everything on a certain young lad’s Christmas list. This kit comes with everything you need to build a computer (apart from the screen) and even start to learn coding, a vital skill for any child growing up in this day and age. Kids love computers and playing games so getting to build their own games is a real winner in my eyes and to them it will seem like nothing but fun, which is brilliant! Even the least sporty child will find it hard not to enjoy a game of ping pong. I myself can’t hit the ball for toffees due to a major lack of hand eye coordination, yet I still enjoy trying. Unfortunately a table tennis table is huge and completely impractical to have in a normal sized house, but this dining table set has everything you need to enjoy a game of ping pong, from the net right down to the wrist bands, and it all packs away into a sturdy red tin. This will be a real winner while the grown ups are snoozing off their turkey dinner. What is Christmas day, without a Christmas craft to wile away some time while dinner is cooking? This mug set comes preprinted with a festive image and your child uses the special paints provided to jazz it up. You can bring it back out year after year as their very own special Christmas Mug. This is a great little game, which helps develop communication skills simply by getting kids talking. Packaged in a small box it’s handy to keep in the car and hand luggage if you are travelling. It consists of a pack of cards, each printed with various questions and conversation starters aimed at getting kids to think about their answers. All mine join in when we play, although a game often takes hours because the kids keep expanding on the original question. O, who granted is a little young for the game only ever answers by putting his finger to his chin and saying ‘Ummmmm. Two!’ which is hilarious. 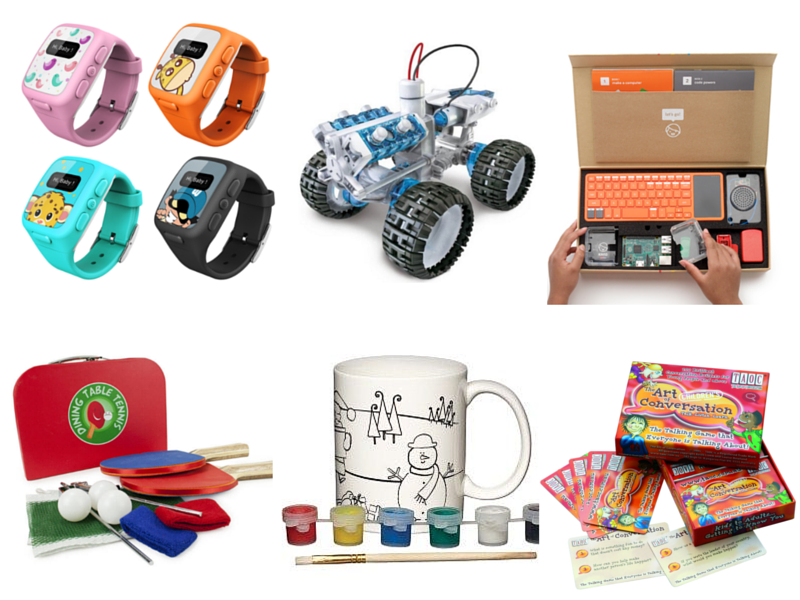 I’m sure you can agree that all these would be great gifts for your children who are too old for kids toys, yet not quite at the teenage stage yet! Disclaimer: I was sent a few items on this list to review, these were items I requested and thought would be great gifts. 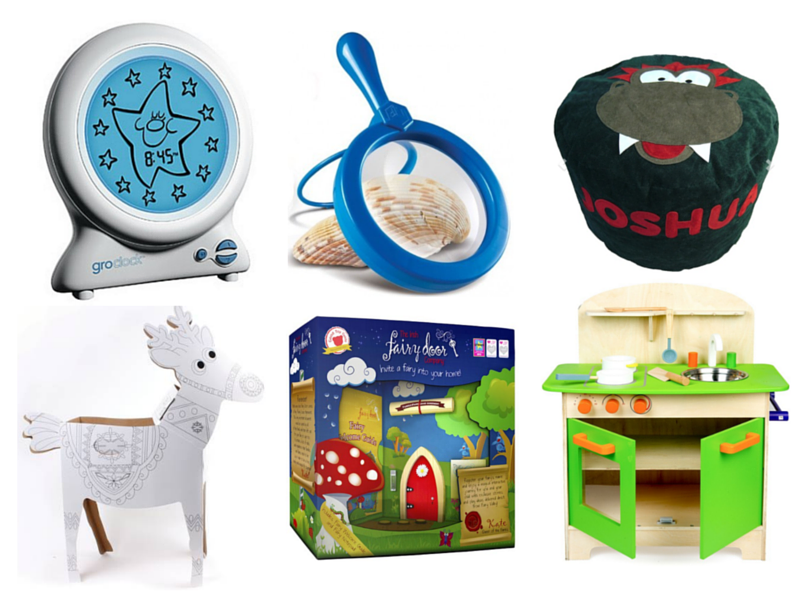 Another day closer to Christmas another gift guide, this time with gifts for younger children, aged from toddler up to about five. This has to be one of the easiest ages to buy for, as long as the only thing on their Christmas list isn’t this years ‘in toy’ that can’t be found for love nor money after September 31st! You can really let your imagination run wild for the little ones, and even get them some of the more practical objects that they ‘need’ because they will likely be ripping through all the wrapping paper without really looking what’s inside anyway! Sometimes (most of the time) kids wake up at silly o’clock in the morning and expect it to be play time. There is only so often that you can put them back to bed before giving up, only to find you are awake before the kids TV channels have even started! This lovely clock, which also doubles as a night light, counts down stars through the night so children know its time to be in bed, until the screen changes showing a sun. The accompanying story book helps children to understand what you mean by ‘stay in bed until you see the sun’ and hopefully everyone will be getting much better nights sleep! Little kids love exploring the world around them so why not let them look that little bit closer with one of these colourful little magnifying glasses? The chunky plastic handles make it an ideal christmas gift for small children and the flip out stand makes it hands free. This colour in Reindeer would be great fun on it’s own, but if you have more than one small child they can have a great time racing each other! They are a great way to fill in some time during the day as the kids can spend plnty of time colouring them in exactly how they want before popping them over their heads and galloping about the place. In a world where kids live with their noses in a screen, it it lovely to see a product that is designed to keep magic alive in the world. These tiny, handcrafted little doors help fairies relocate to your house, school, garden or anywhere, but always have a way to go back to fairyland. They are very well made and are great by themselves, with their three tint stepping stones, but the website also has plenty of products you can buy to help you fairy really settle in well! These bean bags come in a variety of colours and characters so you can choose your child’s favourite animal or colour and have their name added right across the front! These are quite firm bean bags which come in three sizes, so not only are they ideal to perch on to watch a favourite film but they are great to lean against or even used as a footstool. The covers are also machine washable which is very useful when it comes to small children and fabric. Kids just love role playing and having a small kitchen for them to cook up a storm really is a great way to encourage this type of imaginative play. Throw in some tiny pots and pans and a basket of plastic food and you will be the best fed parent in town! So there you have it, six fantastic Christmas gifts for younger children, without a certain pink pig or little blue train in sight! Disclaimer, I was given some of these items to review, but they were products I chose to review and thought good enough to add them into this gift guide.